No guesses or estimates. Get accurate reports of time spent on GitHub issues. Our time tracking software works across devices (mobile, desktop & browser extensions), tracks where your team’s time is being spent and even pauses when they’re idle. Our in-depth reports give you an administrative overview of which GitHub issues are taking up too much time and which ones are getting closed quickly. That way you can prioritize working on your most profitable projects. Hubstaff has automated timesheets for GitHub issues, automated payroll, weekly limits, and pay rates. Hubstaff automates admin work so you can spend time growing your business. Maybe you have a time tracking app, GitHub, an invoicing app, an accounting app… Not anymore. The days of switching apps to put together all the information are over. With Hubstaff’s GitHub integration, you can directly track time to GitHub issues, analyze time data, invoice clients and automate team payments all from one dashboard. Hubstaff has been built with your team at the center and adapts based on your team size. So if you’re a solo freelance developer, you can customize the dashboard to show you the money you earned and time you spent on clients. If you’re a development agency, you can customize the dashboard to show you what team members are working on, how much time they’re spending on client’s projects, etc. Hubstaff is one of the most affordable time tracking platforms in the market. Our paid plans start at just $5/month. Sign up today and your first 14 days will be on us. We also have a 60 day money back guarantee. We recommend Hubstaff to our clients and anybody else that wants to provide more clarity when working with remote employees. GitHub repositories link with Hubstaff projects through oAuth authorization. After approving this authorization, you'll be ready to start connecting your team, enabling them to track time on their issues. Prevent team members from breaking the budget by limiting how much time they can work on GitHub projects. When a limit is set for a team member, they will not be able to track time that exceeds that limit and you will be notified. It's easy to spend more time and resources on a given project than originally planned, but with Hubstaff's project budgets you won't ever have to worry about that again. Simply set a time or monetary budget, and you can be notified as soon as that budget is almost reached. Set schedules for your team so they know exactly when they're supposed to work on GitHub projects. 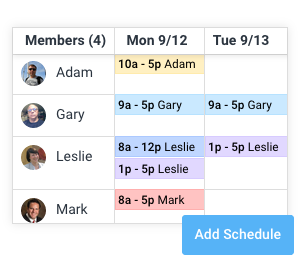 Once schedules are set, you can be notified by email if your team members are late or miss their shifts. Hubstaff automatically generates reports based on the time your team tracks to GitHub issues. These information-rich reports help streamline your administrative duties and make focusing on your important projects easier. You can even get these reports sent automatically to your email. You can pay team members based on the exact amount of time tracked using our payment integrations with PayPal, Payoneer, QuickBooks, Bitwage, or TransferWise. Our GitHub integration was designed to integrate flawlessly into your workflow. Thousands of businesses trust Hubstaff daily. You can count on us. Our average turnaround time is around 10 minutes, so your work never gets held up. I cannot imagine going back to the days of managing a virtual team without Hubstaff. Hubstaff made both the time being worked and the activity level of our team very obvious very quickly. Great, and I mean great, customer support. Great reporting platform. Your team downloads the Hubstaff app and starts tracking! How do I link my GitHub projects and users? A:Here is a support article that explains how simple this is. It’s a one-time setup and takes just 10 seconds. Where do I find my GitHub issues and how do I track time to them? A:If you’re using our desktop or mobile apps, the GitHub issues will show up there. Each task has a small start/stop timer which you can use to track time on those tasks. Each user can only track time on one GitHub issue at a time. Where do I get a report of the task hours? A:You can access task hours from the Hubstaff dashboard at any time or you can opt to get emails with a report of task hours. Can I close my GitHub issues from the Hubstaff app itself? Does Hubstaff have a free plan? A:We have a 14-day free trial with unrestricted access to all features. If you want to extend it by another 2 weeks, no problem - just drop a message to our support team. Can I track time to my GitHub issues using my mobile? A:Yes, using our mobile apps for iOS and Android . A:If you aren't satisfied with Hubstaff, just email us within the first 60 days and we will be happy to refund your money. We don't offer refunds (full or partial) after 60 days. How much does Hubstaff cost? A:Our pricing starts at just $5/month for 1 user. A:Yes, after starting your account you can cancel it at any point. There are no contracts or obligations. Does Hubstaff integrate with any other applications? A:Yes, in fact we integrate with 30+ other applications. Try Hubstaff for 60 days, and if you don't love it, let us know. We'll refund all your money without any hassles. If you work with remote team members, tracking time on your GitHub issues is a must. When you’re working with team members halfway across the world, getting updates about work being done can get a little messy. On top of that, there are sometimes concerns if team members are working honestly. Now, you can work with your remote team at complete ease, thanks to Hubstaff’s automatic GitHub issues timesheets and proof of work. Tired of chasing down your employees as they work on different tasks at different times throughout the day? Keeping track of all of them is no easy job. Hubstaff lets you see your whole team in one place so you can get the information you need at a glance. With Hubstaff’s team dashboard and screenshot features, you can know what an employee worked on in the last 24 hours or previous weeks (up to 60 days). Want to get an update on what your remote developer in India worked on? Just go inside Hubstaff and look at his screenshots. Payroll is a time-consuming task, especially with growing remote teams. Hubstaff's simple automated payroll allows you to set up payments one time so you can focus on more important matters. Your remote employees' pay is calculated to the second using Hubstaff’s time tracker and the individual pay rate you set. Then it's automatically sent to Payoneer or Bitwage. A great worker isn’t necessarily a great remote worker. Working remotely requires you to be incredibly disciplined, especially when your TV show’s latest episode is just one click away. With Hubstaff’s randomized screenshots, activity tracking, and idle time tracker, you can ensure you always get disciplined work from home. Hubstaff even tells team members how much time they’re wasting on unproductive sites and apps while working. Whether you’re a freelancer, consultant, or an agency, you need Hubstaff and GitHub to put your business operations on autopilot and make your business look bigger to clients than it actually is. No need to keep a manual (and often overestimated) count of hours worked on your client’s projects. Just start tracking time directly to your GitHub issues and Hubstaff will automatically create weekly timesheets for you. When your client automatically receives timesheets before they wake up every morning, you know they’ll be impressed by your level of professionalism. Create online invoices, send to clients based on time tracked in their GitHub project, record payments and automate your invoicing process. You'll be able to keep track of which invoices haven't been paid yet so nothing can ever slip through the cracks. Stop adding up hours and start billing hours using the invoicing tools from Hubstaff. Effective cost management begins with setting smart budgets during the planning phase of your projects in GitHub. Hubstaff's project budgets allow you to set limits based on time or cost and we’ll notify you when a project budget is nearing its limit, so you can make necessary adjustments. Working with remote clients poses many challenges, including communicating about progress of projects. With Hubstaff’s proof of work features like random screenshots, activity levels, and app/URL tracking, clients can know the progress of the project any time they want. Thousands of agencies across the world are winning their clients' trust using these features. Hubstaff even offers unlimited viewers for your projects.